BI teams often struggle to keep the business engaged, especially during requirements analysis. This post looks at a graphical technique for documenting information requirements -- one that business people will read and respond to. Keeping the business engaged is one of the keys to a successful BI program. One technique I have found to be very helpful on this front is Laura Reeves's Business Dimensional Model (BDM). The BDM is a technique for documenting information requirements. Before I explain the BDM, a few words on the requirements themselves. Before you can design a dimensional model, you need to capture the business requirements that it will support. The most successful projects capture business requirements by working directly with people in the business, often through interviews or requirements sessions. 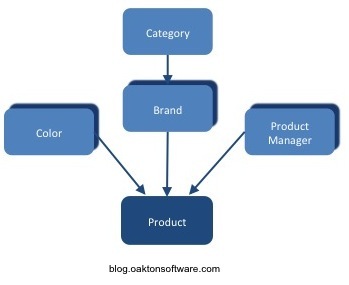 In my book, I suggest that as you organize your information requirements by business function. You then state them in simple form: as a group of metrics and their associated dimensionality. Order Information by order date, order line, salesperson, customer and product. Finally, the major dimensions are cross-referenced to the metric groups in a conformance matrix. These information requirements then drive solution modeling. The next step is to develop a top level dimensional model, and then a detailed database design. 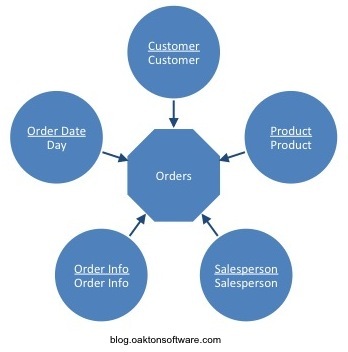 In the book A Manager's Guide to Data Warehousing , Laura Reeves provides a graphical technique that helps keep the business's attention. She calls it the "Business Dimensional Model (BDM)." This technique integrates nicely with the approach I've outlined above. Each group of metrics is depicted in a simple diagram, with the metric group in the center and the major dimensions arrayed around it in circles. Within each circle, the underlined text identifies a dimension. Beneath the dimension, the level of detail applicable in the metric group is listed. The most detailed level of the dimension is shaded darkly. The arrows indicate hierarchies, going from summarized to detailed. Elements that will drive Type 2 slow changes have a shadow. Separate symbols (not shown) are used for junk dimensions, other derived elements, and future attributes. I've found that using BDM diagrams dramatically increases the participation of business stakeholders. People look at BDM diagrams, understand them, and react to them -- often with great enthusiasm. That's a powerful aid in refining and validating your requirements. These diagrams are also easy to produce using the built in drawing tools that come with basic productivity software. This means you can often get business stakeholders to participate in their creation. For example, the pictures above were created in Microsoft PowerPoint using basic shapes and Smart Shapes. As I said back in 2009, I am a big fan of Laura Reeves's approach to requirements and design. As you can see, there is a natural affinity between the BDM and the techniques I've talked about in the past. I encourage readers to check out her book (see below). For a full explanation of the BDM, see Laura Reeves's A Manager's Guide to Data Warehousing (Wiley, 2009). The BDM is covered in Chapter 7, "Modeling The Data For Your Business"
The examples in this post are drawn from my book, Star Schema: The Complete Reference (McGraw-Hill, 2010) A more fleshed out explanation of tasks and deliverables, with examples, cab be found in Chapter 18, "How To Design and Document a Dimensional Model." The examples from this post come from Figure 18-4 (which in turn builds on the star in Figures 3-3, and the hierarchies in Figure 7-3). You can help support this blog by using the links above to purchase these books from Amazon.com.